Our newest product yet, Finish Max in 1 with Shine and Protect offers powerful clean and shine for your glasses while also helping to prevent corrosion - leaving them clean and shiny! 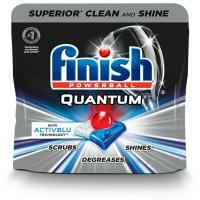 Use it even on your toughest messes like greasy dishes and cloudy glasses for fast action cleaning. Great products. I use and recommend them to friends.